“Wear your harp” nearly as quickly as you can say the phrase! 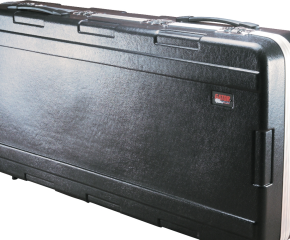 The Shoulder Rest securely takes up the weight right from the center of gravity (the ‘balance point’) of the harp evenly onto rubber-padded arms which rest on your two shoulders. 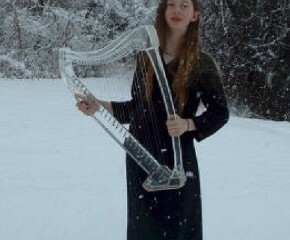 A comfy belly pad attached lower on the harp keeps the instrument at a comfortable location and steadies it side-to-side. You can dance and swing, both hands free, and your multi-stringed musical partner will never leave you thru it all. The rubber-coated arms simply hinge out of the way, so you can put on or take off your harp without contortions and without having to lose eye contact with your audience. We also provide extra-comfy slip-on pads for the Shoulder Rest (not shown in these images) made of either lambswool and leather or fully synthetic is you prefer, so that the weight of the harp is the feel of soft clouds resting on your shoulders. The Cassista Electric Harp ‘Guitar Strap’ attaches to the harp at the top and slings over your right shoulder and then across your left waist to connect to an easy to use kydex hook that extends leftwards from the comfy belly pad, attached nearer the lower end of the harp. The soft belly pad is the trick that gives you the side-to-side stability with one strap that other brands of harp require multiple straps and harnesses to achieve. 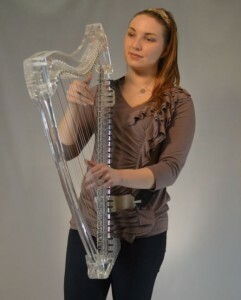 Cassista Electric Harps are intentionally designed to minimize weight at the top. The tuning pins are built into the ‘diagonal arm’ of the harp (where the sound box would be), the bridge pins are replaced by ultra-lightweight clear hardware, and even the weight of the (usually metal) levers is nearly eliminated thru the use of precision machined polycarbonate clamp-style levers. 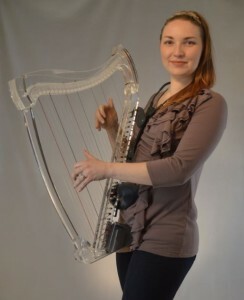 Having a design that is so much less top-heavy than all the other harps, Cassista Electric Harps are comfortable and let you move and play the way you want to. The Shoulder Rest is almost as invisible as the harp, and takes mere seconds to put on or off. 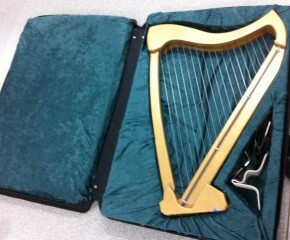 Our ‘Guitar Strap’ is an easy and secure way to hold your harp. Throw the strap over your shoulder and use the left hand to hook it to the bottom piece.